Korean Cultural Center NY, a branch of the Ministry of Culture, Sports and Tourism (MCST) of the Republic of Korea, along with Columbia Artists Management LLC and the Warsaw Philharmonic, is proud to present the U.S. concerto debut of Pianist Seong-Jin Cho with the Warsaw Philharmonic at Lincoln Center’s Alice Tully Hall on Monday, October 24th, at 8 pm. 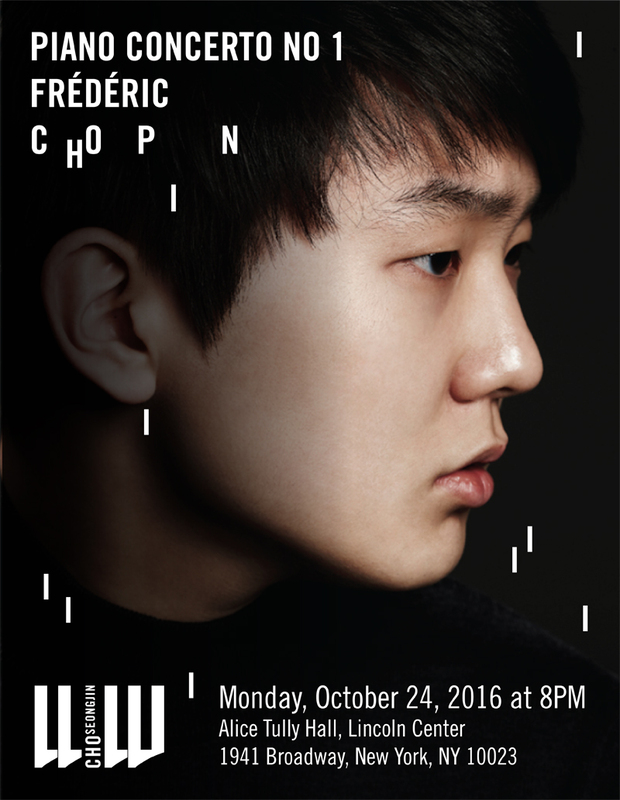 Seong-Jin Cho, First Prize winner of the prestigious 2015 Chopin Piano Competition, was catapulted into worldwide attention since his triumph, and has been making international waves as his accomplishments have translated into success in unprecedented album and concert ticket sales. The 22-year old South Korean pianist has reawakened a newfound enthusiasm for classical music especially within his native country, and outlets have likened his rise to fame as “heroic”; the recording by Deutsche Grammophon of live highlights drawn from Mr. Cho’s competition performances instantly garnered the endorsement of the world’s top music critics (“Unequivocally brilliant” by the Telegraph, London) as well as achieving triple platinum sales within a week of its release in South Korea and reaching No. 1 in the nation’s pop album chart on the strength of pre-orders alone. Cho’s sold-out performances following his 2015 win has been further cementing his status as an important global artist. Seong-Jin Cho’s performance is a part of the Warsaw Philharmonic’s 14-city United States tour under the baton of Artistic Director Jacek Kaspszyk. The orchestra boasts a history of 115 years and has been one of Poland’s most distinguished musical institutions, The Los Angeles Times praising them as “sensation, a highlight of the year” and “one of the best-kept secrets in the business.” As the orchestra of the International Chopin Piano Competition, the Warsaw Philharmonic and Seong-Jin Cho’s uniquely special relationship will be showcased in New York, adding another layer of significance to the New York presentation. The performance at the Lincoln Center features a program that highlights the famous Chopin Piano Concerto No. 1 with Seong-Jin Cho. In addition, the Warsaw Philharmonic will also present the New York debut of Mieczyslaw Weinberg’s Symphony No. 4. The concert will also include Brahms, Tragic Overture in D minor O. 81. The concert is being produced by Columbia Artists Management LLC. For more information on the United States tour that spans both coasts, please visit www.cami.com. Support for the Warsaw Philharmonic’s New York concert is provided by the Korean Cultural Center New York, the Polish Cultural Institute New York, and Asiana Airlines. To purchase tickets, please visit http://www.lincolncenter.org/show/warsaw-philharmonic-orchestra or call Alice Tully Hall Box Office at 212-721-6500. Seong-Jin Cho was brought to the world’s attention in October 2015 when he won First Prize at the Chopin International Piano Competition in Warsaw. Four years before he had won 3rd Prize at the Tchaikovsky competition, aged only 17. With his overwhelming talent and natural musicality, Seong-Jin Cho is rapidly embarking on a world-class career and is considered one of the most distinctive artists of his generation. Born in 1994 in Seoul, Seong-Jin started studying the piano at 6 and gave his first public recital five years later. In September, 2008 at the age of 14, he won the 1st prize at the 6th Moscow International Frederick Chopin Competition. In November, 2009 he won the 1st prize at the 7th Hamamatsu International Piano Competition in Japan (youngest winner in its history). Seong-Jin has performed with some of the world’s major orchestras including the Royal Concertgebouw Orchestra, Philharmonia Orchestra, Mariinsky Orchestra, Munich Philharmonic Orchestra, Berlin Radio Symphony Orchestra, Seoul Philharmonic Orchestra, Czech Philharmonic Orchestra, Budapest Festival Orchestra, Danish National Symphony Orchestra, Russian National Orchestra, Radio France Philharmonic, NHK Symphony Orchestra, under renowned conductors such as Myung-Whun Chung, Lorin Maazel, Marek Janowski, Mikhail Pletnev, Valery Gergiev, and Vladimir Ashkenazy. Future engagements in 2016 and 2017 include concerts with the Philharmonia Orchestra and Esa-Pekka Salonen, St. Petersburg Philharmonic and Yuri Temirkanov, Accademia Santa Cecilia di Roma and Valery Gergiev, Russian National Orchestra and Mikhail Pletnev, Tokyo Philharmonic and Myung-Whun Chung, Orchestre de Paris and Tomás Netopil. Seong-Jin will play debut recitals at the Concertgebouw Recital Hall, St. Petersburg Philharmonia, London International Piano series, Suntory Hall in Tokyo, Prague Spring Festival, Klavier Festival Ruhr, and Carnegie Hall’s main hall. Since 2012, Seong-Jin Cho has been living in Paris. After studying with Prof. S.R. Park, S.J. Shin in Seoul, he studied with Michel Béroff at Paris Conservatoire National Supérieur de Musique. For press inquiries, contact Mickey Hyun mickeyhyun@koreanculture.org or pr@koreanculture.org, 212-759-9550 (ext. 212). Inaugurated in 1979, the Korean Cultural Center New York (previously known as the Korean Cultural Service New York) is a branch of the Ministry of Culture, Sports and Tourism (MCST) of the Republic of Korea. Under the authority of the Consulate General of the Republic of Korea in New York, KCCNY works to promote cultural arts exchange and stimulate interest in Korean culture through various opportunities. KCCNY provides diverse activities including exhibitions, concerts, film festivals, and educational programs. KCCNY is located at 460 Park Avenue (at 57th Street), New York City. www.koreanculture.org.